Bebe Gul, 44, is a school security guard in Mazar-e-Sharif. She attended school through 8th grade. Here is her story. Mazar-e-Sharif — For me, gender violence means doing bad things to your wife, beating her, not letting her go out of the house. It is a custom in Afghan families. In our family, my husband gives more freedom to my sons. And in the past when I was young my father did not let me continue my studies, but he let my brothers continue. I can never forget that. I was the witness to gender violence in my father’s family when my father let all my brothers finish their school and then university, but he did not let me and my sisters continue our studies. I get in a panic sometimes. I really feel sorry for being an Afghan woman. In our own country gender violence is increasing, although the government is trying to control it and stop violence. But they cannot and the reason is that our country and people are traditional. In the past when I was in my father’s house, my sister’s rights and mine were taken away and in my marriage I have the same problem. I am still confused about how to struggle against it. I think I cannot do it alone. The government should do more announcements in the media about women’s rights and about how bad it is to have violence in a family. They should encourage men to be good with their daughters and wife and talk about how to stop gender violence. I am not the right person or the best person to stop it. The government knows better about the solutions. But as an Afghan woman I wish to see equality in my country and happiness on the face of each woman. My message to other women is to fight to stop gender violence in our society and never give up. 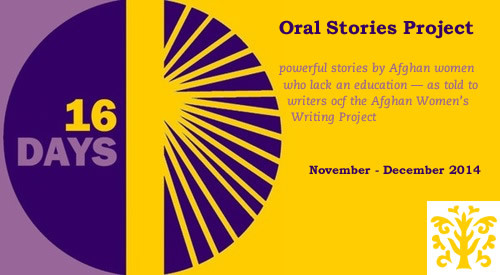 By Bebe Gul, as told to Humaira G.
Bebe Gul was interviewed for AWWP’s Oral Story Project on Gender Violence 2014. Your essay is very touching in its simple honesty. I hope you know that women around the world have some of these same problems, even if the situation in Afghanistan seems especially harsh. The women of Afghanistan can learn some tactics from other women who have had to fight for their own rights. Confronting violence in the home is especially difficult because women are sometimes isolated from others who can help them. So I guess the first thing, more than expecting help from the government (which might or might not happen) is that women need to promise to take care of other women and girls. Women need to stand up for other women and girls. Women need to insist to the men and boys in their lives that it is simply not possible to inflict violence on women, even if that other woman is their daughter-in-law. Women need to learn how to fight in self-defense. Women need to learn to protect themselves, to protect their children and to protect other women. Women need to refuse subservience to men. A lot of times men will try to convince women that religion demands subservience. This is false religion. All humans enjoy an equal relation to the divine. Anyone who tries to tell you that your salvation depends on subservience is simply trying to make you their slave. This person is putting his own interest above the interests of the true divine. You can start a club that has a mission to protect women from violence in the home. You can organize the women in your own home, in your own neighborhood, in your village or city. Organize women to respect, love, and protect other women and girls. If all women insisted on the rights of women, then finally the men would have to obey. Some enlightened men can be very important in this struggle, so maybe they can be special members of the club. You can talk about how culture stands in the way of such a club, but what I am saying is that you, Afghan people, can organize to change that culture. Women have done this in other societies. Women have fought hard for their rights, and they have to continue to fight because men always seem to want to take away women’s rights. This comes from an animalistic sexual urge to dominate. We humans need to rise above this brute animal existence and let humane culture develop. This is a difficult time, and I wish for you all the best. Thank you for your essay. Please know that women around the world support you in your struggles.